Barnes & Noble Inc. is releasing a new Nook e-book reader for the holidays, while it evaluates the future of tablet computers. 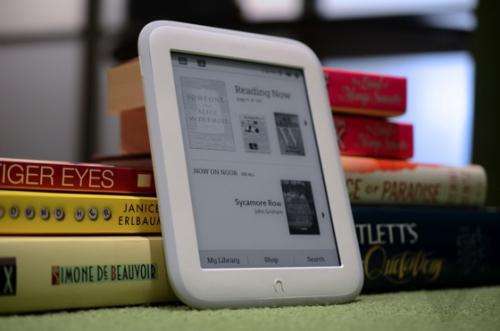 Nook tablets haven't sold well amid intense competition with Apple's iPad, Amazon's Kindle Fire and others. Barnes & Noble had a slim 2 percent share of the worldwide tablet market in the fourth quarter of 2012, but fell off IDC's top 5 list this year. The company said it isn't giving up on tablets, but it will focus on a new e-reader this year while continuing to sell last year's tablet models. The move comes as research firm IDC says the market for dedicated electronic-book readers is declining. Instead, consumers have been more interested in tablets, which can do much more, including video, email, Facebook and games. Barnes & Noble's new e-reader, Nook GlowLight, is available in its retail stores and online starting Wednesday for $119, the same as the standard model of Amazon.com Inc.'s Kindle Paperwhite reader. At 6.2 ounces, the GlowLight is 15 percent lighter than the Paperwhite. It's also ad-free, while Amazon charges $20 more for a Paperwhite without ads on its screensaver or home screen. Barnes & Noble officials say the new e-reader's design is based partly on feedback received at the company's retail stores, where Nook devices are prominently displayed. Consumers' suggestions led to a brighter screen on the brightest setting and more durability in the form of a rubber-like silicone edge, which also provides comfort in the hands. In addition, the frame is white, not black, to match the screen color. Jonathan Shar, general manager for emerging digital content at Barnes & Noble, said that even as attention has turned to tablets, e-readers are still popular for long-form reading. The GlowLight has an electronic ink touch screen, which has better battery life and less glare than typical tablet screens. Unlike Kindles, which are tied to Amazon's bookstore, Nook devices are compatible with books bought at other stores that use the EPub standard, including Apple's iBookstore. The new Nook device replaces the $99 Nook Simple Touch GlowLight model from last year. Barnes & Noble will still sell the $79 Simple Touch e-reader, without the built-in reading light, and Nook HD tablets with screens measuring 7 and 9 inches diagonally. The smaller tablet starts at $129 and the larger one at $149. Nook's future had come into question after Barnes & Noble said in June that it would stop making its own Nook color touch-screen tablets and would farm out manufacturing to a third-party. But its CEO left a few weeks later, and the company said instead it was reviewing its Nook strategy. Michael Huseby, the head of the company's Nook business, said in August that the 4-year-old Nook business has had some success, with 10 million devices sold and a 22 percent share in the e-book market. But he acknowledged the company had been overly optimistic about demand. In an interview this week, Mahesh Veerina, chief operating officer for the company's Nook Media business, said Barnes & Noble will be looking to make devices that enhance the reading experience, as opposed to building an all-purpose device. "We are evaluating our road map and product plan," he said. "We don't want to play in this general tablet market and compete with everybody."